There are so many thoughts as to why Google would be releasing such a high-dollar device and the opinions are as diverse and ingenious as they come. The fact still remains that until Oct. 4 only Google really knows the motive behind this game-changing Chrome device known simply as the Google PixelBook. Why did Google drop the Chromebook nomenclature? Who knows, but in my opinion, I think Chromebook PixelBook sounds a bit redundant. There’s also the fact that this device could very well be the Chrome OS counterpart to similar PCs from other platforms. MacBook, Surface Book, etc: it’s kind of like a little club. Again, Google will hopefully shed some light on all of this in San Francisco in two weeks. Until then, we have been gathering some very interesting evidence surrounding not only the PixelBook but what may be a much larger initiative by Google that will be championed by this new device. I call this a theory but I’ll be honest, between my gut, the mounting pile of puzzle pieces from the Chromium repository and recent moves from Google, I will go so far as to say that I am convinced this is what the search giant is up to. First, there is the insanely large amount of storage that Google looks to be offering in the PixelBook. Robby and a number of our readers have made some really good arguments as to why the new Chromebook would have so much hard drive space. I’ll let you take a look and form whatever opinion you like. Let’s not forget that, if we are correct, this new Chromebook we know as ‘Eve’ will be equipped with newer NVME SSD storage which is leaps and bounds faster than the traditional eMMC drives found in most Chrome devices. Android Apps? Highly unlikely. The standard onboard storage on any given Chromebook is more than fast enough to read, write or anything else it needs to do for Android applications that were designed for much smaller devices. Not to mention the sheer size of the storage. I barely flirt with 64GB of storage on my phone. Why on Earth would I need 512GB on my Chromebook when it isn’t normally my go-to device for things like Snapchat or Instagram? Just saying: it doesn’t really feel like a legitimate reason. Then there is the rumored price of the PixelBook. If the reports were correct (I saw the ad for myself on my own Chromebook and the number was real), the top-tier PixelBook will come in just under $1800. That’s a lot of cheese, even for a Pixel-branded Chromebook. Then again, this isn’t the same breed of a device as the 2015 Chromebook Pixel and Google’s interests have expanded exponentially in the computer market as of late. Yes, it’s a lot of money. No, it won’t be a device your average consumer is going to go pick up on a whim. On the flip side of that, many – and I mean many – have scoffed at the price while I have countless friends and acquaintances who have dropped 2-3 grand on a MacBook without thinking twice. The fact is if you want this device and it’s capable of doing what you need it to do, you’ll buy it. If not, there are plenty of great Chromebooks out there to choose from that will cost you less than $500. With all that being said, I will cut to the chase and share my thoughts on who I think Google is really targeting with the new PixelBook. From there, we will work our way back and try to fill in some of the blanks. Now I know this may sound like a simple answer – and believe me there is much more to this than I can comprehend – but over the last couple of weeks, I have stumbled upon more and more signs pointing to the fact that Google has set their sights on the corporate sector. First, let’s talk VM or virtual machines. Late last month, Google announced the rebranding of the Chrome Management Console to Chrome Enterprises. This was much more than a logistical change in names, however. Along with the upgrade, Google brought some new tools to the table for companies to better adopt Chrome OS while still leveraging the power of their current infrastructure. This is where virtual machines come in. Companies like VMWare are giving enterprises the capability to access corporate software via virtual environments on the Chrome OS desktop. This is nothing new. VMWare has offered these services for some time but now it has become an integrated part of the Chrome Enterprise platform. VM extensions are essentially tools that allow users to access, deploy, configure and install software across multiple virtual machines. One of the biggest uses of these extensions is in the Microsoft Azure container-based, cloud platform developed for – you guessed it – enterprises. Recently, I stumbled upon the addition of VM extensions to one of the devices being developed in the Chromium repository. After a few hours of digging, I found that this device was the first Chromebook to have this “feature” turned on. Stop disabling VM extensions on Eve. VMs will be used to host containers soon. 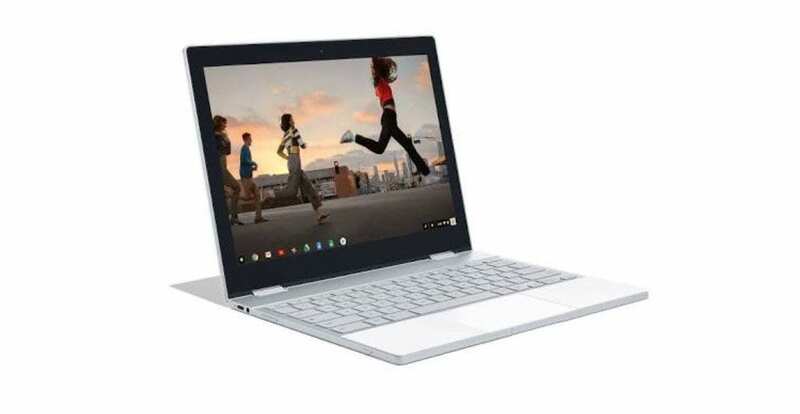 That’s right, ‘Eve’ or as we are convinced, the Google PixelBook. Whatever Google is planning, it appears that the PixelBook will have the ability to run VM extension making it a host or administrative device for any number of other devices. Did you notice the commit about mentioned “containers?” Well, this plays a large part in the hypothesis of where Google is headed. Chrome OS isn’t new to the container game. The long-awaited Android on Chromebooks movement works on this very principle. I am completely inept when it comes to explaining how the container environment works, but if you’d like to learn a little more about, here’s a handy little PDF that breaks down the details. Running Android in a container on Chrome OS. To dumb it down, whatever application, software or program that is being implemented is packaged independently to run on top or alongside the native OS and that package is encapsulated in a container. This allows the program to run using the OS’s resources and structure while keeping it isolated from the core of the OS. With enough development, the container method could potentially allow full desktop work environments to run “natively” on top of Chrome OS in the same way Android does now. All of this lines up with what Google is already doing with Chrome Enterprise. Virtual desktops, headless software, cloud computing and even Linux workstations may soon be accessible from Chrome devices. Speaking of workstations, it’s no secret the Googler’s use a multitude of devices including MacBooks and Linux desktops for development and other tasks. While a Chromebook is capable of running a Linux environment via the hacky, dual-boot method, they weren’t designed with that particular task in mind. So Google and many other companies default to actual Linux stations for development and hosting platforms. With the abilities of containers on board, a device like the PixelBook would be more than capable of being a well-rounded development computer or even be used as the host for a whole network of computing systems. I would propose that what Microsoft Azure is already doing, Google is looking to take a bite out of. The PixelBook could be the poster-child of this movement. The plot thickened, even more, when I unearthed some work being done on Chromebook ‘Eve’ that involved support for Microsoft-specific HID (human interface device) tools. From my limited understanding, it appears that the new Chromebook will have built-in support for Microsoft’s protocols for things like palm rejection on touchpads and touchscreens. If the Chrome device isn’t running, emulating or “containerizing” some form of Windows or Microsoft software, why the need for this support? I took a closer look at the owner of the commit, Dmitry Torokhov, and found that he has been a software engineer for the Chrome OS team since 2014. Prior to that, he spent almost 6 years working on Virtual devices for none other than VMWare. Coincidence? I don’t believe in them, but your guess is as good as mine. Then there was a little news story going around about Google offering to send Chromebooks to Microsoft Azure partners to give them an opportunity to talk about what they have to offer to the Virtual Machine market. All of this brings us full-circle and might answer the question about the large amount of storage on the PixelBook. A developer’s device needs drive space. A hosting computer has to have room for stuff. The more, the better. Clearly, Google is positioning itself in multiple aspects to make its move on the enterprise market. Now, I think all of the pieces are in place and much as they did with the education sector, they are poised to have a major impact on the antiquated business arena. The PixelBook has the potential to be the perfect device for this kind of move. Yes, as a consumer device it’s pricey. But, as an high-end, developer’s laptop it should have all the computing power a large infrastructure needs while still being cheaper than many of its Windows, Mac or Linux competitors. The rabbit-hole continues to go deeper and deeper as we dig up details on Google’s new device and their future plans for Chrome OS. Check back tomorrow as we go more in-depth sharing our perspective on what the end-game may be. What do you think? Could Google be looking to conquer the corporate world or is the PixelBook really just another “because we can” kind of device?